Planet Cycles Shop Rides We are currently running Beginner's Ride on the first Saturday of the month and Women's Ride on the third Saturday of the month. Both 6-8am. Level R1 : Beginner riders who are capable of riding an hour or more on their own at a speed of 20km/h. These rides are to introduce riders to the rules and concepts of bunch riding. Speed on flat terrain: as required. This is a no-drop ride. Level R2 : Group Riders who are using clipless pedals, capable of riding at least 40km on their own at a speed of 25km/h. 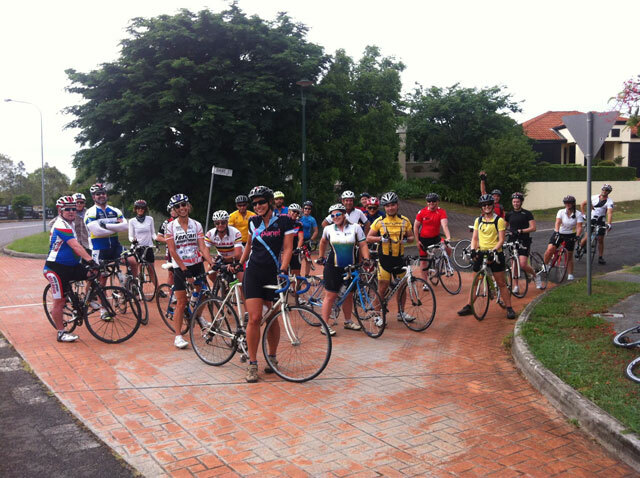 Emphasis is on group ride skills, staying together and enjoying a social ride. Speed on flat terrain: 27-30km/h. Level R3: Group Riders who have more advanced skills and fitness on more challenging terrain. Speed on flat terrain: 28-32km/h. Emphasis on group ride skills, safe execution of more advanced skills generally provided by more challenging terrain. **ROAD RIDES - Drop-bar Road Bikes only - no time-trial bikes, please remove any time-trial clip-on bars before joining the group. Level G: Gravel Grinder Ride. These routes will involve varied surfaces - tarmac, gravel and trail and will be graded according to the levels 1,2,3 similar to R and M levels. Level M1 : Beginner mountain-bikers who are keen learn skills to allow more enjoyment and safety on the trails. Skills parks/green trails. Level M2 : Mountain-bikers with intermediate level skill and fitness. Blue trails. Level M3: Mountain-bikers with more advanced skills and fitness levels. Blue and Black trails. Rides may be described as between levels for example:- R2/3 - the ride will be level 2 but with slightly more challenging terrain. Suitable for regular/accomplished Level 2 riders. All riders must be members of Club Planet and be registered for each ride in which they participate. All riders must obey the instructions of the Ride Guides at all times and hold the safety of their fellow riders as paramount. See below for bunch riding tips. No rides will go if it is raining or the roads are too wet! For further information please contact the shop on 38919033, email manager@planetcycles.com.au. This ride is hosted by PCS Coaching. · Departing Cleveland McDonalds Carpark, 50-52 Shore St, Cleveland. · For male and female riders who want to improve MTB skills/intensity. · This is not a beginners ride and is rated as intermediate to advanced. Keep an eye out on www.facebook.com/PlanetCyclesRides for information on other rides or post your own ride to see if you can build numbers! At Brown Dog Cafe after Saturday morning ride having some great coffee! 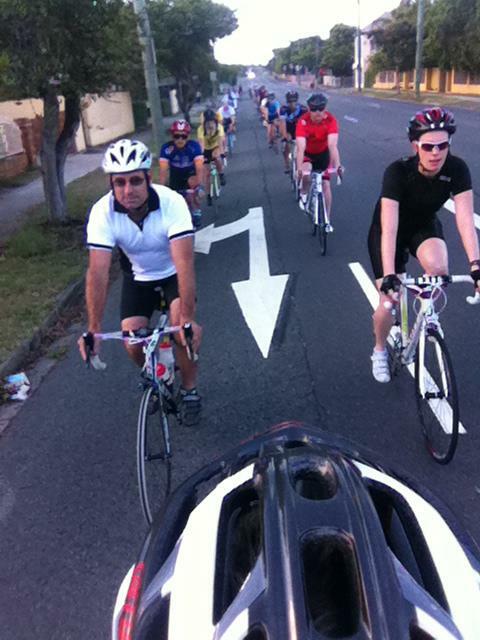 A photo of just one of our many beginners group rides around Wynnum. I acknowledge that the Cycling Activities, Rides and Events are inherently dangerous and may involve risk. I recognise and understand that there are risks specifically associated with Cycling Activities, Rides and Events which include, but are not limited to, collisions and contact with other participants and other road users such as motor vehicles, riding on roads which are or may have traffic on them, the remoteness of the areas in which a ride takes place, sudden and unexpected changes in weather, physical exertion and difficulties in evacuation if I become disabled. I acknowledge that accidents can and often do happen which may result in me being injured or even killed, or my property being damaged. Prior to undertaking any Planet Cycles Cycling Activities, Rides or Events, I acknowledge that I am aware of all of the risks involved, including those risks associated with any health condition I may have. Planet Cycles and its Ride Guides and event Coordinators will take all reasonable steps to protect your safety and well being but will not be held liable for events, accidents or damage either to yourself or any other persons or equipment caused during any and all rides and events conducted by Planet cycles or its coordinators. Your bicycle must be in a road worthy condition and be able to be operated in a safe environment with others. Both brakes must be installed and working on your bike. Parts and accessories should be secured safely and front and rear lights should be fitted and working for appropriate conditions. On a fine day weather conditions may deteriorate to reduce sunlight and it is advisable that working lights are installed on your bike all the time for when this happens so they can be turned on as required by law. Your must have a properly fitted and buckled up a Australian Standards Approved helmet. It is strongly recommend to have a working front and rear light fitted to your bicycle at all times and to use these lights to prevailing conditions as required by Law. Triathlon bars while they are permitted to be installed on bicycles in our group rides the handle bars are STRICTLY NOT TO BE USED on our rides especially in a group riding situation. These handle bars are not safe to use in a group riding situation and any riders failing to adhere to this rule and a Ride Guides instruction to stop using them will be ask to leave the ride. 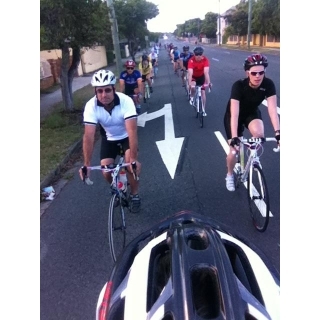 When attending a Planet Cycles group ride you must be competent to be able ride safely in a group situation. Riding in a group requires a lot more skill and concentration than riding by yourself. 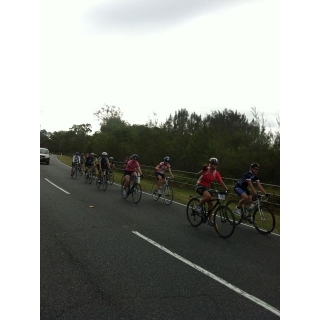 If you do not process enough skills to ride in a group safely you are not permitted to attend a group ride. From time to time Planet Cycles may conduct a Beginners Course, which may include lessons as to how to ride in a group. Riders should attend one of these Courses before attending a group ride so their skills are adequate at the time of their first group ride. Having sufficient skills to ride in a group situation is the responsibility of the rider attending. 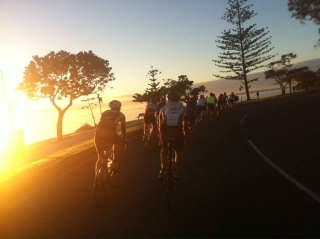 During all Planet Cycles Cycling Activities, Rides or Events you must agree to abide by ALL road rules, obey the directions of police officers and all Planet Cycles organisers, agents, PLANET CYCLES RIDE GUIDES or employees. You may from time to time be ask by our Ride Guides to alter or adjust your riding style for safety reasons and you must comply to those requests. If you do not comply with such requests you may be ask to leave a ride and/or possible cancellation of your Planet Club Membership. Before Planet Cycles Cycling Activities, Rides or Events Rider Briefings will be conducted for the safety of all participants. All riders must attend the Rider Briefing before the commencement of the ride or you are not allowed to attend that ride or event. You must agree that safety precautions undertaken by Planet Cycles such as supervision, ride safety briefings and directions from Ride Guides are a service to me and other participants but are not a guaranty of safety. When and Where are you on our ride and under our control? You are only under our control when you choose to ride in our group as a group in a safe riding manner. If you choose to slow down and stop for what ever reason or choose to go faster than the group or group Ride Guide and leave the group you are no longer under our control and your riding conditions and responsibilities should be consider not different as if you went for a ride by your self. Our " ride group" is determined as being a group of riders in two breast formation or as required by law at the time with the last rider being no more than five meters from the back of the group and the front rider is no more than five meters in front of the group. If you are more than five meters from the rear or front of the group we consider that you have chosen to leave our group and you are no longer under our control and you are responsible for your own riding. A safe average riding speed will be determine before any of Planet Cycles rides and will be determined on the number of riders present and their skill level and/or experience of the riders. 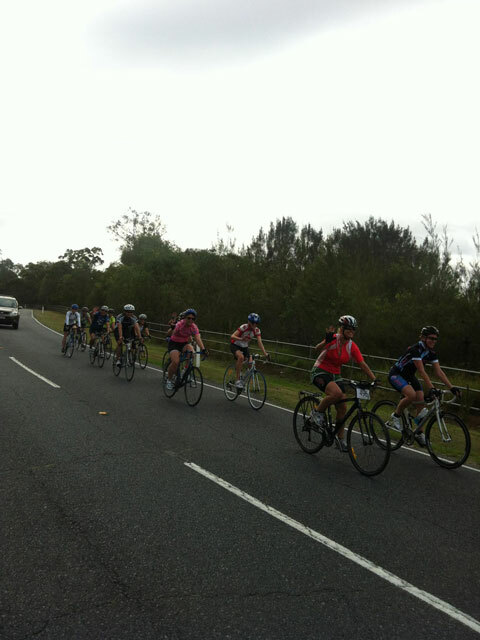 A Ride Guide will determine the group predicted average speed before the ride commences. BUT our MAXIMUM SPEED LIMIT on any Planet Cycles ride is 40KM PER HOUR. From our experience we do not believe it is safe to ride on open roads with traffic and various road conditions in sometimes-unknown weather conditions at above 40km per hour. Riders breaking our Planet Cycles Speed Limit do so at their own risk and by doing so acknowledge that they have left our group ride and are no longer part of our group ride no differently as if they went for a ride by themselves. Riders continuing to disrupt our group ride by treating the rides like a race and going over the Planet Cycles 40km speed limit will no longer be able to participate in our rides and their club membership will be cancelled. In the event someone does crash their bicycle the group is to slow down safely and stop riding until the crashed rider has been attended too and/or treated if necessary. A serious crash would entail an ambulance was needed to attend the scene with one or more riders needing medical treatment from the ambulance. If it is a serious crash the ride is automatically canceled and is not longer under the control of Planet Cycles. All rides vary in the way rider punctures are dealt with. In large groups it's not possible to stop for punctures usually as time does not allow for this and it's not as safe as letting the group ride on in a safe formation. Before Planet Cycles group rides leave it is determine as to whether that particular ride is a "ride on for punctures" or a "stop for punctures" group ride. The number of riders in the group and the ride course and conditions determines this and the ride guide will inform you before the start of the ride. While every effort is made by Planet Cycles Ride Guides and organizers to keep the entire group together so that everyone can enjoy the group ride this may not always be possible.It is usually safer for the group ride to continue on rather then having the group continually slowing down or stop for one or more riders who's ability does not meet the criteria of the ride and they are simple having a bad day or are un prepared. 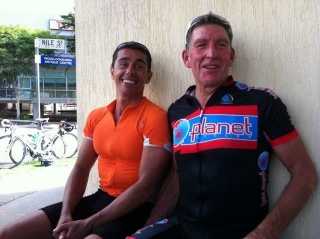 Riders should know their own limits before taking part in a Planet Cycles Group Ride as our average speeds and kilometres traveled are out lined on our rides page on our website and explained before the group rides. If you are dropped from a Group ride you are responsible for getting yourself back and home safely and you should know the road conditions around you and the area you are riding in so you can return home safely without any issues. We do not have the resources to look after riders on a one for one basis who are ill prepared or ill informed riders. These riders should seek out a beginners riding course, which some clubs and Planet Cycles have from time to time. Rider abuse by anyone in our club or group will not be tolerated for what ever reason. If you are caught abusing any person of the general public or another rider you will be asked to leave the ride and/or possibly have your club membership suspended or canceled. It is strongly recommended that all Planet Cycles Club Members and riders seek out and purchase sufficient personal insurance from an authorized reputable insurance company or join another entity or club, which would provide sufficient personal insurance in the event of an accident to a person's body and/or equipment. Cycling Queensland or Bicycle Queensland membership is strongly recommended. In the case of children under the age of 18 years old, I hereby agree to the Terms and Conditions and the Policies and Rules on behalf of my child (ren). I further agree that Planet Cycles Pty Ltd, its officers, activity organisers, ride guides and other participants may from time to time give instruction. Planet Cycles is not responsible for providing that instruction or supervision to my child (ren). We strongly recommend all children on our Planet Cycles Rides be accompanied by one of the child's parents or guardians as the parents or guardians are responsible for their own children. I agree that my registration for any Planet Cycles ride or event is not transferable to any other people and I agree that if any event is cancelled or the event format and /or course is altered due to weather or other " Acts of God ", or for any other reason I agree to those changes. This is the very annoying symptom usually of somebody who is a bit nervous and excited. You finally get to the front and the guy next to you speeds up until his wheel is about half a wheel (or more) in front of yours. Not wanting the rest of the group to end up not being next to each other in their pairs, (or not wanting the other guy to think that he's better than you), you speed up to match his pace. But, he still needs to be that little bit in front so he speeds up - again, until everyone in the bunch has gone up two or three gears and 10km/hr and no-one is particularly happy. REMEDY - when you are second wheel, make sure you know the general speed of the bunch, when you go to the front, keep your speed around the same, and keep your wheels and handlebars in line with the person next to you. such as holes, rocks or debris on the road, calling out "hole" etc as well as pointing is helpful in case someone is not looking at your hand when you point. It is just as important to pass the message on, not just letting those close to the front know. Another obstacle is a parked car, call out "car" and sweep your hand around your back to let people behind know. Other things to point out are runners or walkers on bike tracks and slower bikes if you are passing someone on the road. Can be done one of two ways. Firstly and most commonly by each pair staying together until they get to the front. After having a turn on the front (generally about the same amount of time as everyone else is taking),the pair separates and moves to each side, allowing the riders behind to come through to the front. To get to the back, stop pedaling for a while to slow down, keep an eye out for the end of the bunch and fall back into line there. It is safer for everyone if you get to the back as quickly as possible as the group is effectively riding 4 abreast until those two riders are back in. The other, safer way is for the whole group to move in a circular motion through the bunch. One side (say the left) moves forward, when you get to the front, halfway through your turn, move across to the right (tell the person next to you!) you will then be required to move back to second wheel when the person on your left is ready to move over. This way is definitely safer in traffic as the bunch is never more than two abreast and is also more social as you get to ride next to different people. If you are on a training program where you are required to do intervals, always do them from the back of the bunch. Tell the people around you what you are doing and move out of the line safely, then go your hardest! When you are finished, slow down, and get back into the bunch where you were if there is still a gap or go to the very back. If you are in the bunch and there is no-one beside the person in front of you , you should move into that gap (otherwise you will be getting less wind-break than everyone else). Conversely, if you are that person and no-one moves into that gap beside you, you should move to the back of the bunch, the next pair to roll off will come back and one of those riders will fall in beside you. An appropriate gap between your front wheel and the person in front is around 50cm. Keep your hands close to the brakes in case of sudden slowing. Sometimes people who are not used to riding in a bunch will feel too nervous at this close range - riding on the right side is generally less nerve-racking for such people as they feel less hemmed in. Watching "through" the wheel in front of you to one or two riders ahead will help you hold a smooth, straight line. Especially at traffic lights - if you are on the front, and the lights turn orange, they will definitely be red by the time the back of the bunch goes through the intersection and you will be endangering the lives of others if you run it. Generally the call will be "clear" if there is nothing coming at a turn and 'car" if there is something coming. If somebody gets a puncture or mechanical, either the whole bunch should wait with him or her and make sure they have everything for the repair and are OK. Courteous riders will wait with the person and then help them to pace back onto the bunch. Of course it will depend on the length of the ride and the distance from the destination.